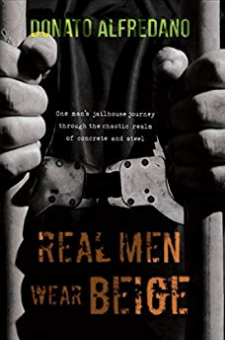 Real Men Wear Beige is a fascinating look at a journey through the US criminal justice system that’s truly unique in its perspective and delivery.Like most people, before author Donato Alfredano gets caught up in the system, he’s hardly given the issue of prison a thought. But his unanticipated arrest at JFK Airport on a charge of official misconduct was a reality check that would forever change his views on incarceration, and on a larger scale, life. Donato’s deeply expressive story chronicles his passage through the New York criminal justice system and on to a brief stint at the infamous Rikers Island, then to his local county jail to await his sentencing hearing, eventually landing in state prison on a five-year sentence.One thing that stands out in this provocative narrative is the surprising diversity of personalities and experiences, which makes this book an invaluable resource for those interested in gaining a fuller view of the incarceration picture.Real Men Wear Beige has a corresponding Audio Soundtrack and CD slated for upcoming release, featuring songs Donato wrote to express the emotions and events swirling around him and his fellow inmates. It includes guest appearances by some notable recording artists and musicians. The Soundtrack is available at www.rmwbeige.com.